As I've mentioned in other posts regarding gluten-free bentos, I am NOT the expert in this area, especially since no one in my house has issues with gluten or with food allergies in general. Hence, the need to have some friends share ideas regarding school lunches, bento, and GF alternatives. But sometimes, I do find things that catch my eye and remember that I've had blog questions about GF or allergy free foods. We were given packages of Bee Nut Free products in a Christmas basket this year and had to share. Bee Nut Free is a local Colorado company that produces a line of gluten free treats that are also nut and dairy free. As well, most of their treats are free from the top 8 allergens, except for ones with chocolate that do contain soy. ETA: The people from Bee Nut Free just contacted me--the chocolate is now soy-free as well, so all products are free of the top 8 allergens! One more ETA: From Bee Nut Free again - We do not use a dedicated line for the sunflower seed spread cookies therefore, I cannot claim to be "free of soy" - SunButter is manufactured on equipment that processes soy. Now, if you want true reviews of something like this, it's from F&B, considering they both can eat regular foods as well. Today, in their bentos, they had the Bee Nut Free granola bars and the Sunny Honey Cookie Bites. They both loved the granola bars and Ben also liked the cookies. Shaun sampled Faith's cookies too and pronounced them good (high praise from the guy who bought and froze half a dozen boxes of Thin Mints). So definitely, we'd recommend these, and in finding the website for you, I discovered they are located right by where we go skiing! 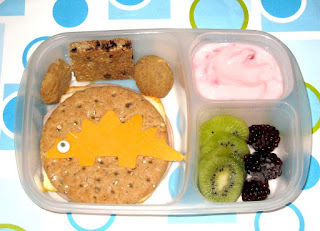 Back to the bento, Ben had a turkey and muenster sandwich on multigrain rounds, topped with a cheddar dinosaur. On top of that are his aforementioned cookies and granola bar. To the right, he has strawberry yogurt, kiwi and some frozen blackberries (because I ran out of non-frozen fruits). It's packed in our Easy Lunchboxes (also available on Amazon). so awesome :) thanks for sharing about this company Shannon!